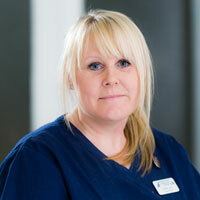 I started my nursing career in 1995 at Gilmore Vets and went on to qualify in 2004. After returning to nursing after maternity leave I joined Atherton in 2006 and became involved in nurse training as a Clinical Coach. I later became Head Nurse in 2013 and I love every aspect of nursing and take great pride in helping our practice to grow. I have recently completed an oral care course and I am currently studying a course on common poisonings in small animals in between being a busy mum to my 2 children.